Even as autumn is beginning, we still have several months to watch the large asterism known as the Summer Triangle. This huge star pattern looms from south to overhead in the autumn evening sky. The Summer Triangle consists of three bright stars in three separate constellations. The stars are Vega in the constellation Lyra, Deneb in the constellation Cygnus, and Altair in the constellation Aquila. Today’s chart has you looking south to overhead on an autumn evening. If you crane your neck to look straight up, you will see the three bright stars forming the Summer Triangle. How can you recognize them? Well, Altair is noticeable as a bright star with two fainter stars on either side of it. Deneb lies at the top of a cross-like figure . . . the pattern of the cross is actually another asterism, known as the Northern Cross. This cross lies inside the Summer Triangle. Vega is recognizable for its sapphire-blue color, and for the fact that its constellation Lyra is small and distinct in shape. Lyra consists of a little triangle, of which Vega is part, with a little parallelogram attached. Finally, if you are looking in a dark sky, you will see that a rich region of the Milky Way – the edgewise view into our own galaxy – runs through the midst of the Summer Triangle. 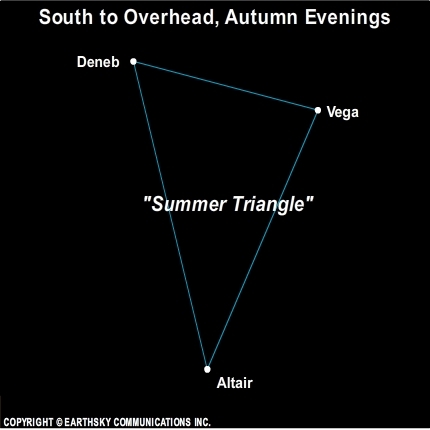 On September and October evenings, look for the Summer Triangle to shine from south to overhead. Next Story: EarthSky Tonight—Sept. 30, What bright star flashes red and green in northeast?